These EvidentialGene sets for 12 arthropods, fishes and plants are the most orthology-complete, compared to same or related species gene sets by well regarded gene discovery methods (NCBI, Ensembl, Augustus, Maker, Glean, ...). 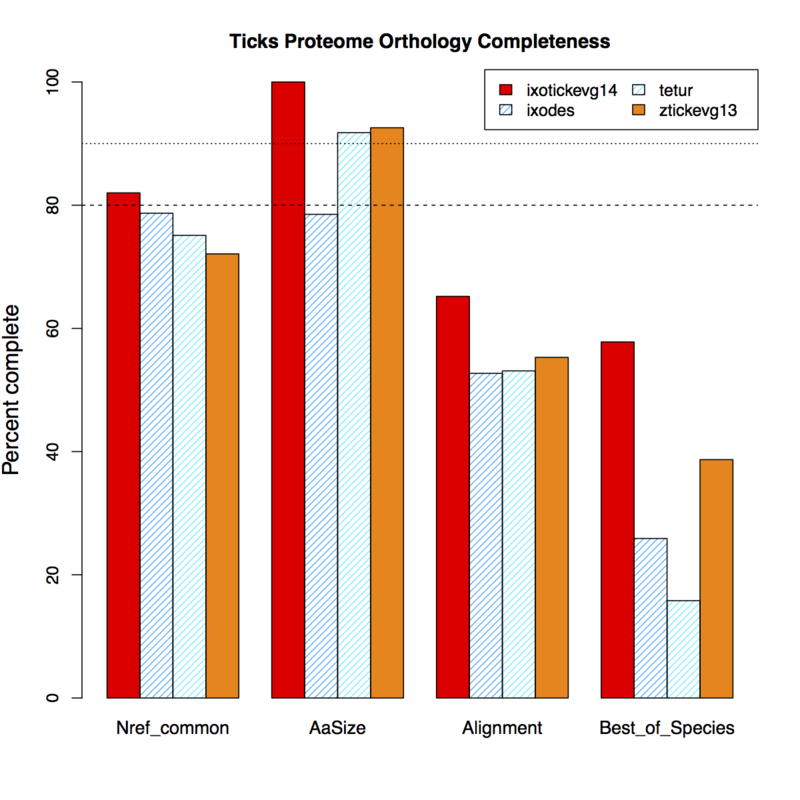 Orthology-complete is the measure of presence and fullness of genes with protein homology to related species. This measure is for a subset of genes that have orthology to 9,000 gene families that are shared by 10 species across arthropods, plus human and fish. Similar completeness of gene set ranking is obtained using conserved protein domains (NCBI CDD). mRNA-assembled genes are constructed without any reference protein information, nor with genome data. Genome gene sets use both reference genes and genomes to produce gene models. 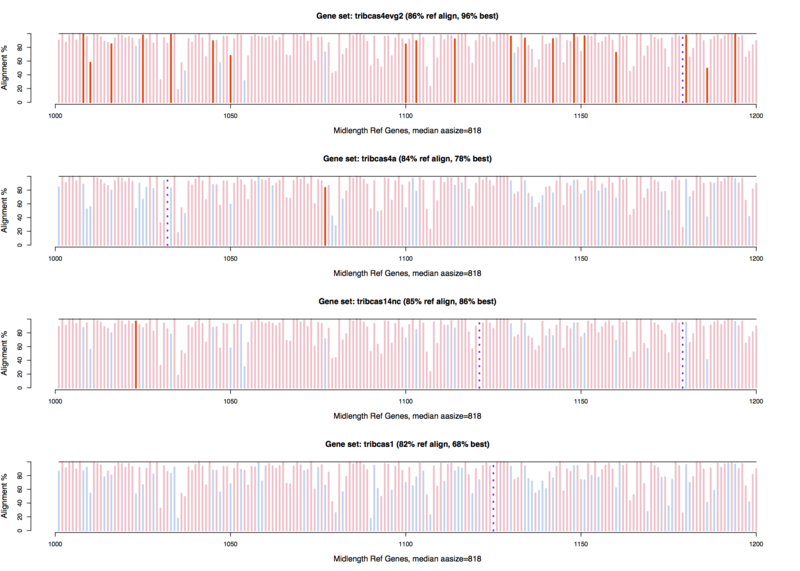 I.e., the genome genes have the answers in front of them, while mRNAseq genes do not. Some of these gene set comparisons use the same RNA-seq data, where the genome-based versions have added sources of information, and of errors. If genes can be fully constructed from mRNA-seq alone, then adding genome data, prediction software, and related species proteins may contribute more mistakes than improvements. This summary shows that Arthropod species gene sets constructed from mRNA-seq are often more complete than genes from genome-modelling methods. mRNA-seq genes are more biologically convincing as they don't rely on the reference species genes, predictions or genome assembly, and thus are not subject to artifacts from those sources. When they match the reference genes, it is true discovery. Align_common = Alignment to Reference ortholog protein, as percent of ref protein. 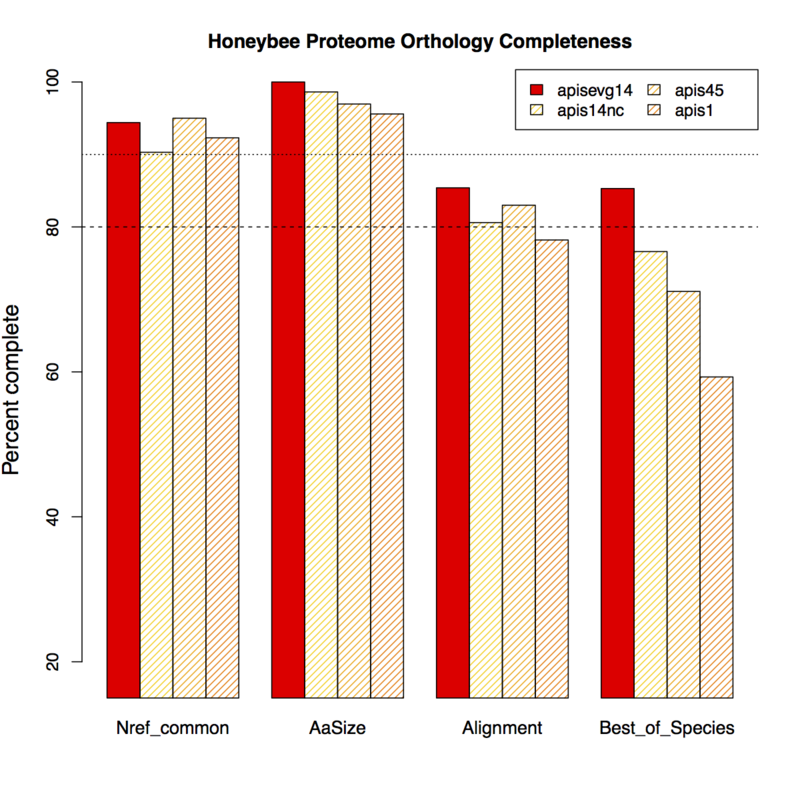 Best_of_Species = gene set score for all reference orthologs, as percent of all ref gene families, from best, or same as best (tie), align score per reference gene over gene sets. I.e. 100% best for setA = all orthologs have best/tie score for setA, none better in sets B or C, 90% for setA implies 10% better in other gene setB, setC,.. Species gene sets left-right order, newest to oldest, as listed below. 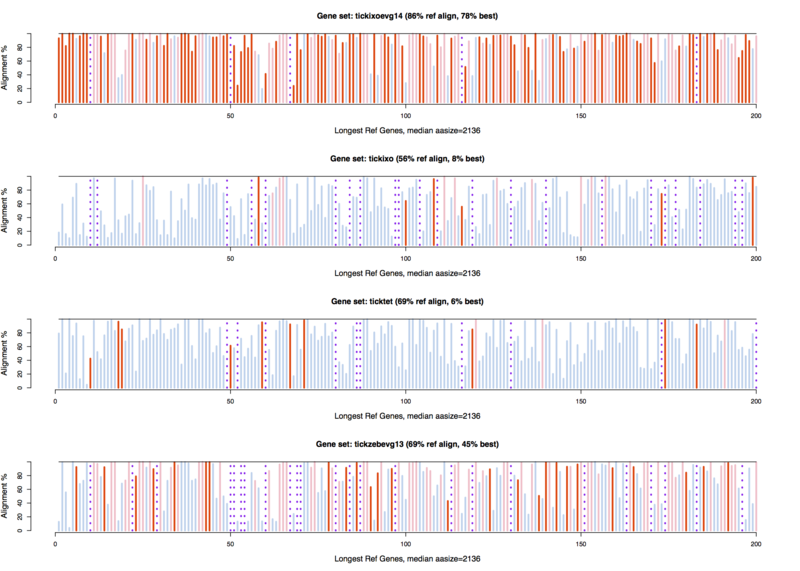 Evigene sets are solid color bars, others are hashed color. 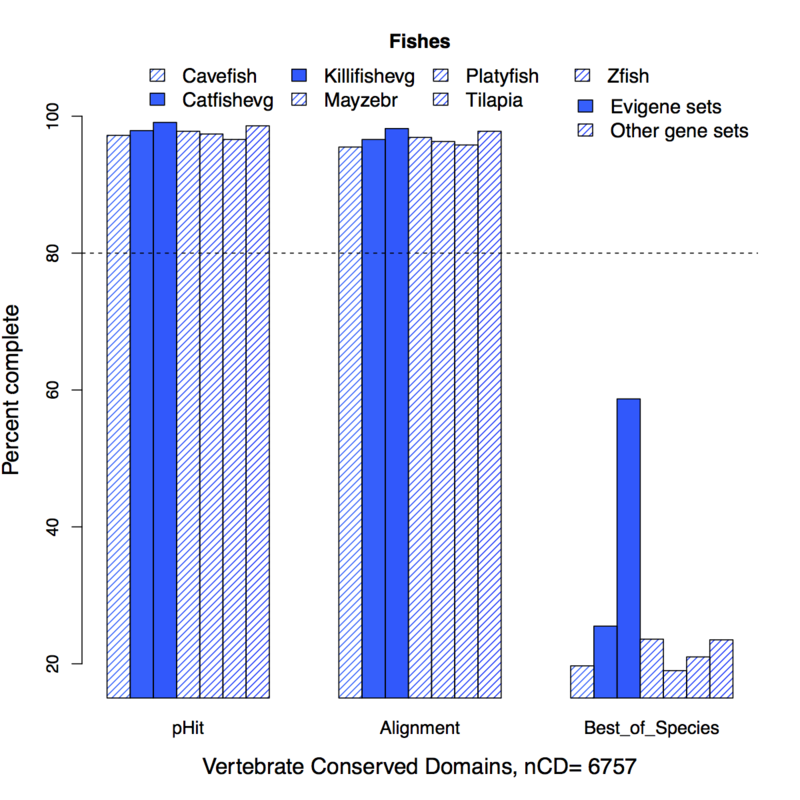 Conserved Domains from NCBI CDD (2014.10), subsets by taxonomic group, CD found (a) in Arthropods, (b) in Vertebrates, and (c) in Plants with deltablastp. CD set for Arthropods (a) is determined as Eukaryote CD that occur in all 3 clades Insecta, Crustacea and Chelicerata, in at least one species gene set. Alignment = percent Alignment to Domains. 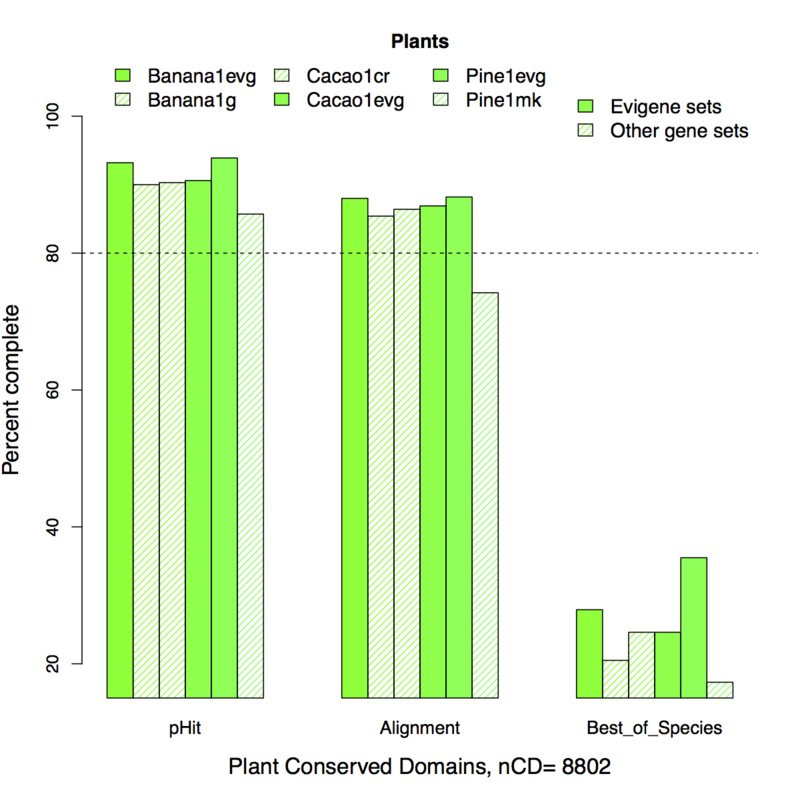 Best_of_Species = gene set best with longest alignment, or same as best (tie), per domain, as percent of all domains. I.e. 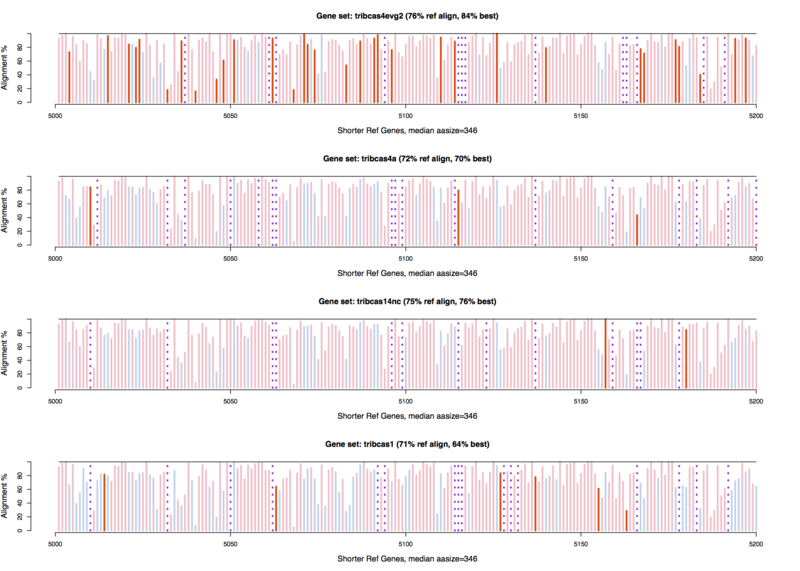 100% best for setA = all genes have best/tie domain alignment for setA, none better in sets B or C, 60% for setA implies 40% better in other gene sets. Calculations are within species/clade (color coded sets), normalized to 100% of all CD per clade. 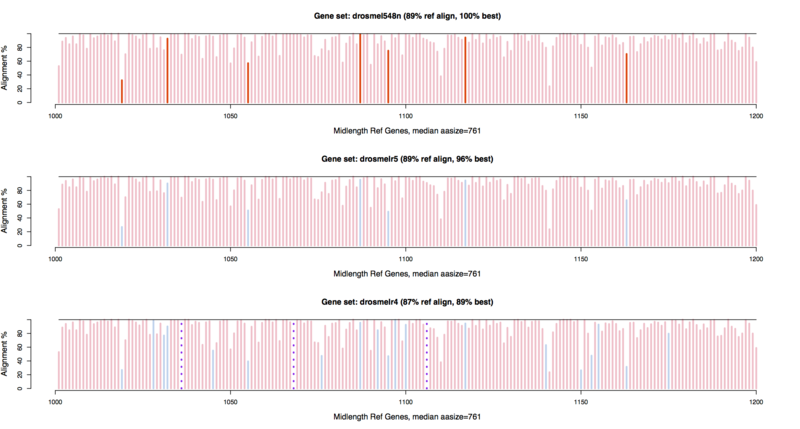 Arthropod gene sets are left-right ordered, newest to oldest, as listed above. 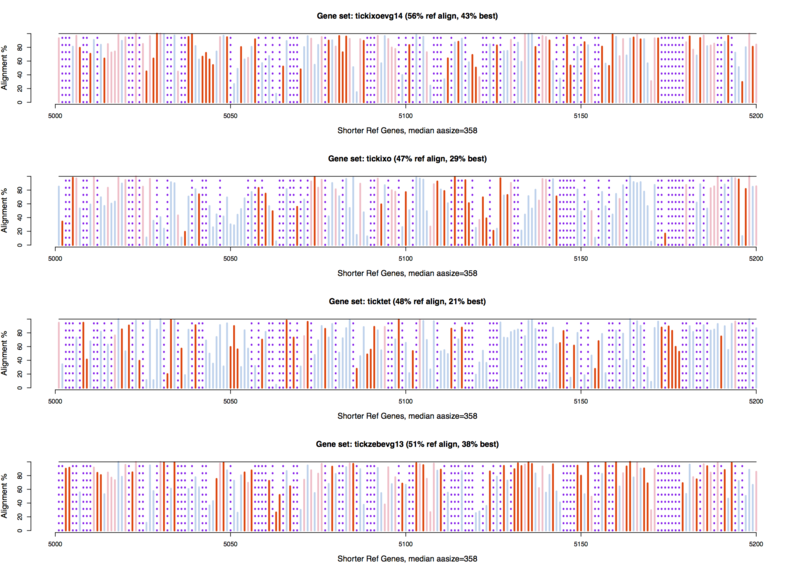 Evigene sets are solid color bars, others are hashed color. Gene set rank order for Best_of_Species are same for Orthology group and Conserved Domain analyses. The target gene/transcript assignment to ortho-groups is changed, to one group per target locus (per species gene set). Prior method allowed alternates of locus to fill other ortho-groups, which can be biologically valid for some loci, but also included a large set of weak, partial aligned group members. Also calculation of alignment and identity from blastp tables, per gene is updated, to improve addition of part-hits (HSP), with little effect except for a few largish genes. This update reduces number of "missed" ortho-groups for the gene sets with few alternates. The CDD analysis is not affected by alternates and is unchanged. One visible consequence in the per-group bar graphs (Figs 6a-6f) is that Longest reference gene groups are almost all filled by each gene set (i.e. few misses for these most obvious ortho-genes), while short reference gene groups still contain a fair number of misses per gene set (shorter genes are in some ways harder to accurately find, due to "noise" factors). 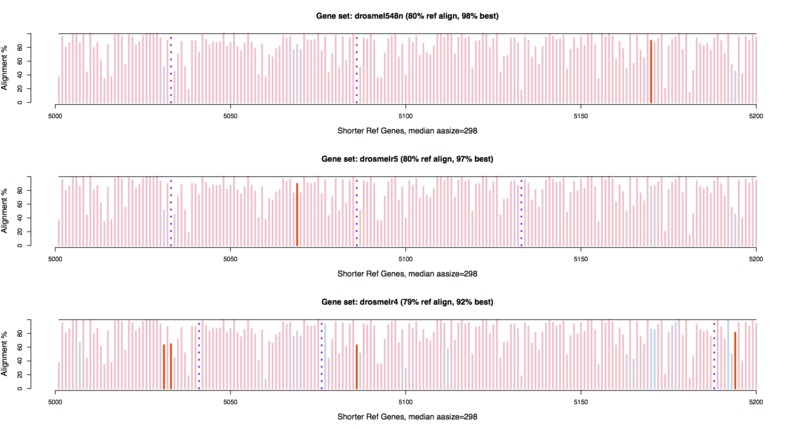 For the longest genes, sizes often differ among gene sets, esp. the initial gene sets have many short/partial models of complex long genes, see eg. Ticks (Fig 6c) where partial genes are common with the fragmented genome assembly of deer tick OGS1. Another consequence in the summary bar graphs is the Best-of-species percentages have increase for poorer gene sets, to within 20% to 30% of top scoring gene sets. 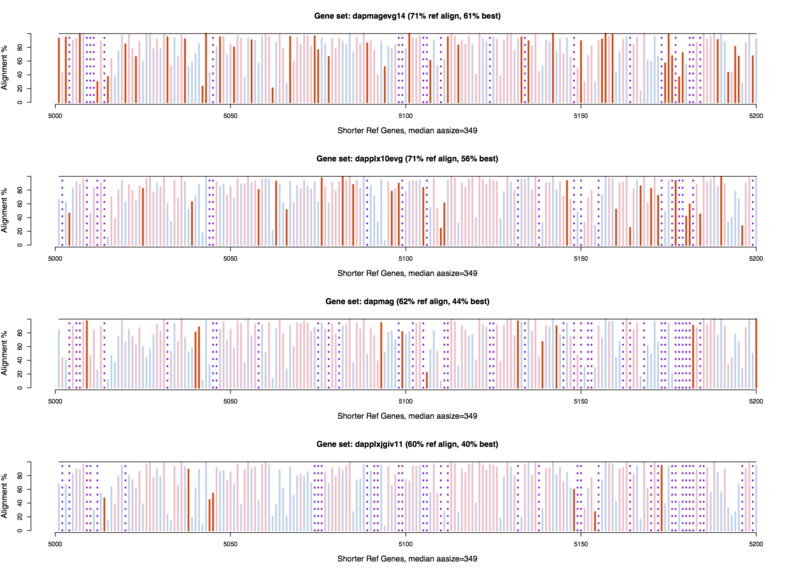 This is still a large range in gene set completeness. 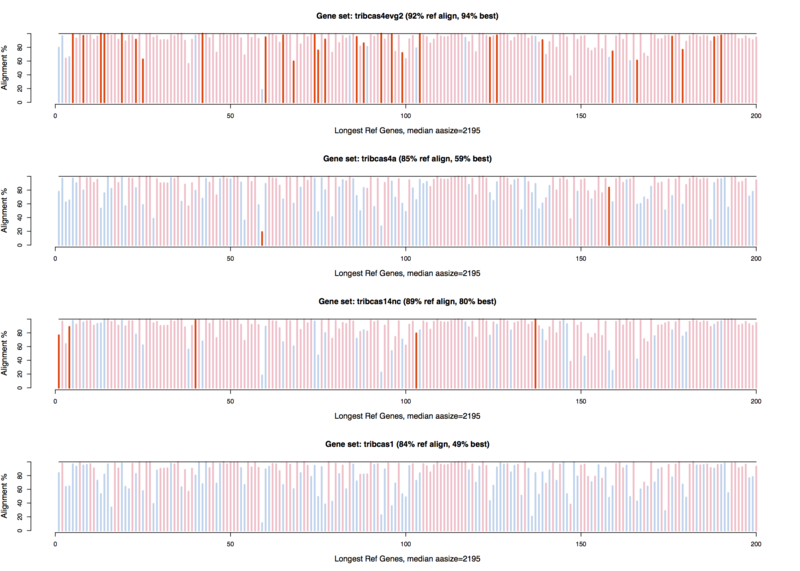 Notice the comparably small range in Fruitfly gene set versions that span over a decade of effort. Both these changes indicate a likely more valid way to assess gene set qualities in this restricted case for orthology-completeness. Bear in mind this is one gene set quality, albeit perhaps the most biologically rigorous one available. Prior data and plots of 2014-Nov assessment are available here. 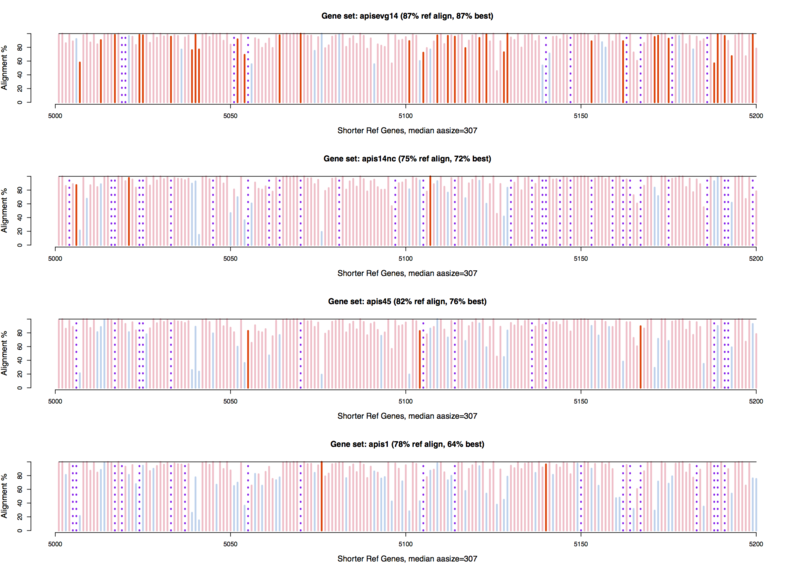 Orthology gene groups are those of ARP7 OrthoMCL analysis set of 10 species, group IDs of ARP7f_Gnnn, such as ARP7f_G1000. 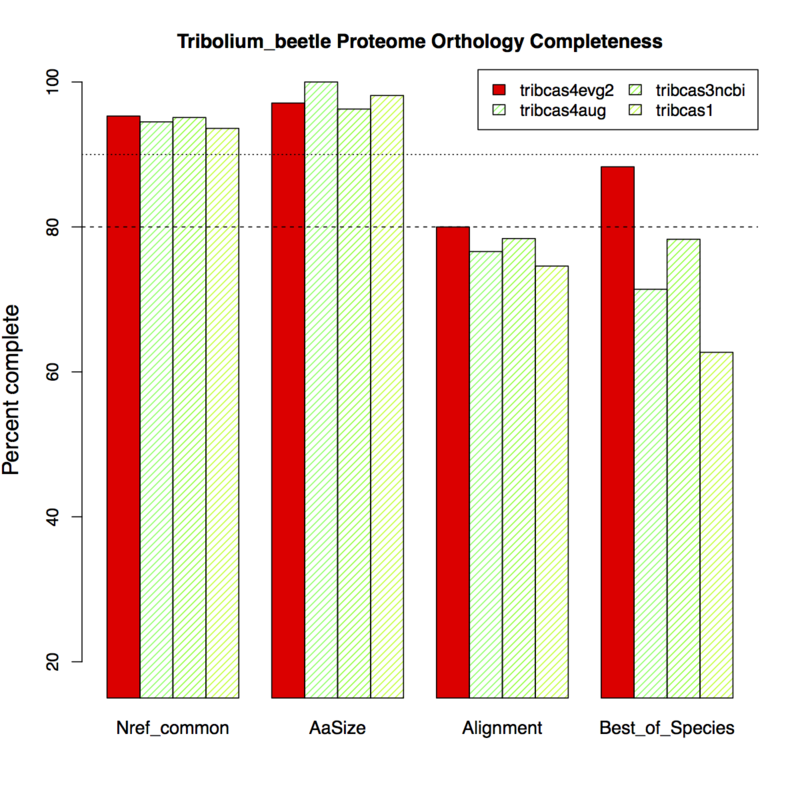 including orthology tabulations and annotations, and species gene set proteins. Tables for this analysis were produces using blastp of all transcript proteins (primary and alternate) to the ARP7 OrthoMCL reference protein database (n=131876 proteins of 10 species). 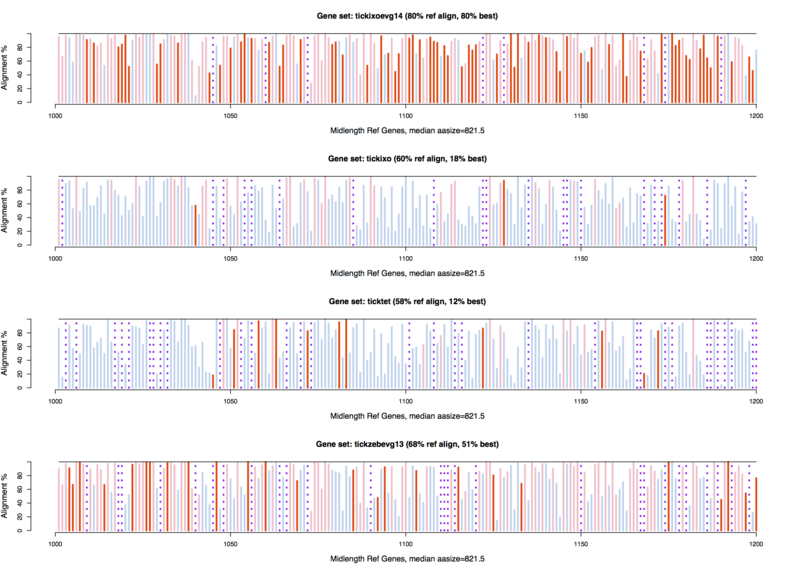 The best aligned or best bitscore match of query gene set to reference database is tabulated, along with reference ARP7 gene group. These tabulations exclude same-species matches (query-ref). Alignment score is prefered over bitscore (or e-value) in this analysis because the bitscore is very strongly affected by taxonomic distance, alignment less so. 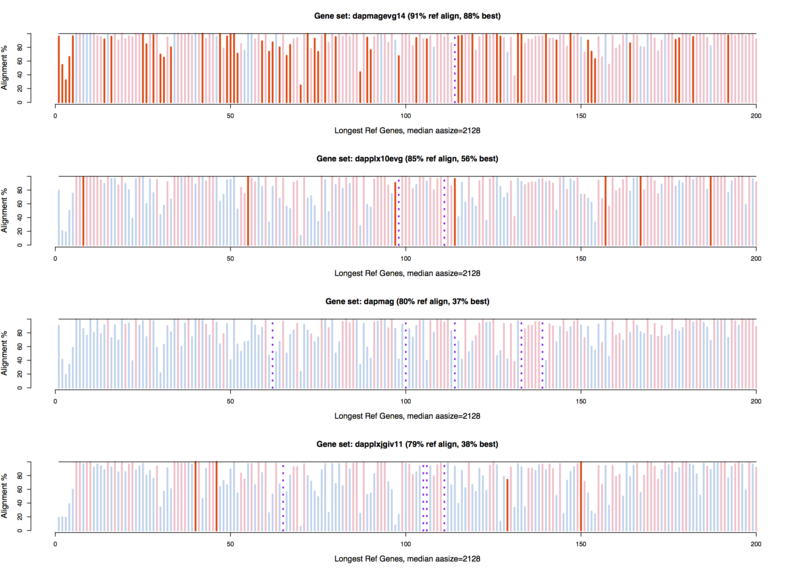 Using bitscore gives different results per gene, but returns the same basic results in overall gene set qualities. 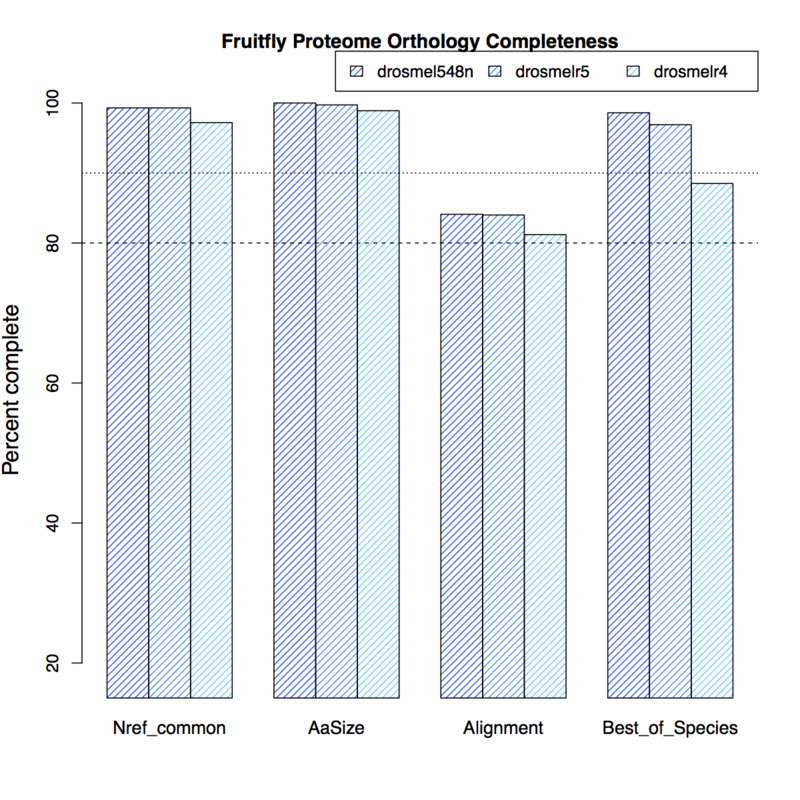 Tabulation of closest alignment of query genes x reference orthology gene group includes classification of Best_of_Species across gene sets per species, as Best=higher alignment than any others, Same=tied for top alignment (within 2% of top), Diff=lower than top alignment, Miss=no alignment to reference orthology group gene. For Ticks gene sets, related species were grouped into Best_of_Species classification. 39357 human   Homo sapiens human, UniProt 2014 ? 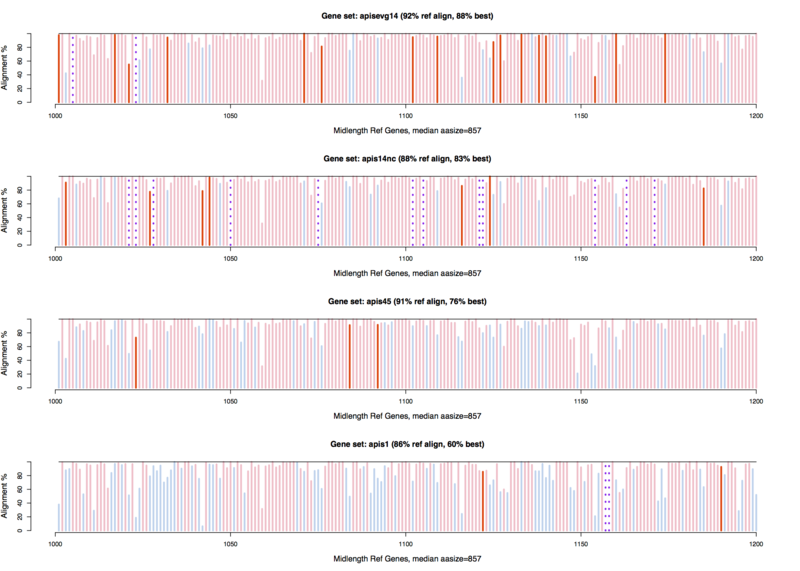 OrthoMCL (www.orthomcl.org) methods include reciprocal best blast hit (bbh) of all primary transcript proteins (one protein/gene locus), then tabulation of best reciprocal hits for within (paralog) and between (ortholog) species, followed by Markov clustering (MCL) to form gene groups. 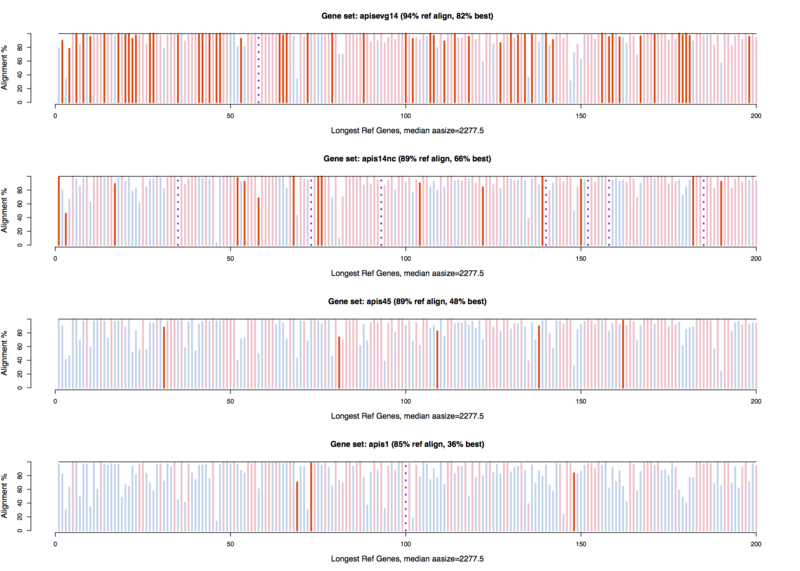 Several papers attest to the validity of OrthoMCL and MCL clustering for identifying orthology gene families. 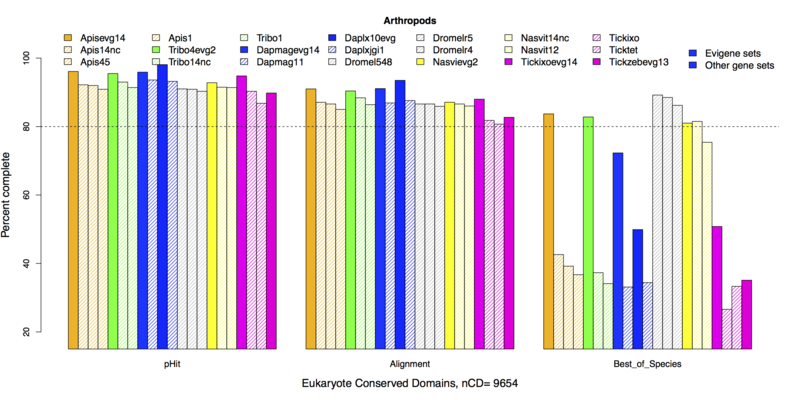 Conserved Domain analysis is performed with NCBI deltablast, using cdd_delta database of 2014 Oct. CD subsets are derived from taxonomic division common to all sequences provided as representatives of each CD. 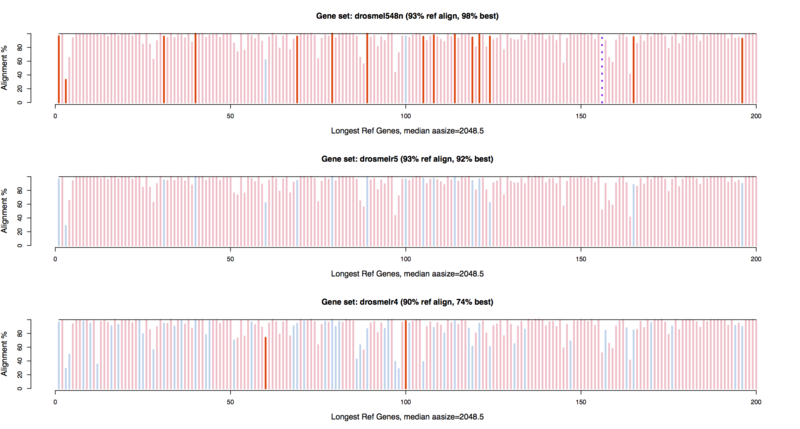 Longest alignment to each CD, or highest identity, per gene set is used to measure gene set presence (Hit) and score. 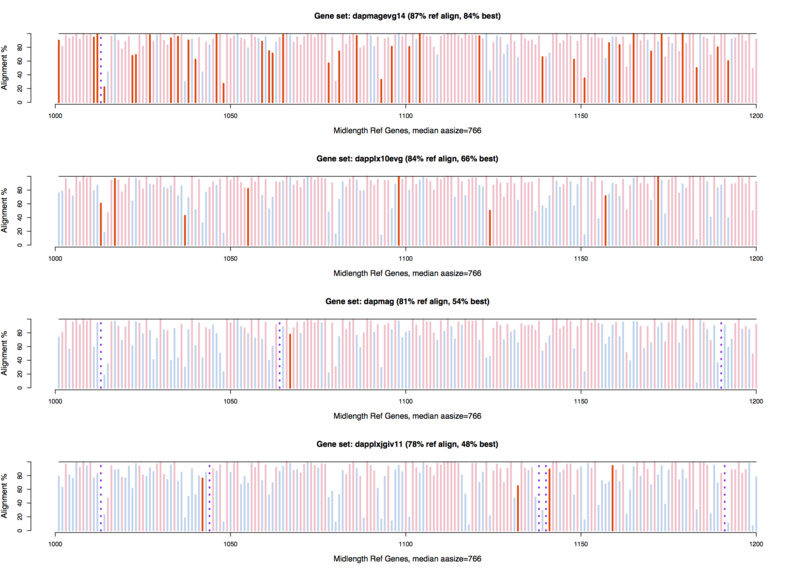 Alignment and Identity scores give equivalent rank orders for gene sets. Bitscore and e-value are not used because they are confounded by sizes of proteins that are always longer than domains they contain. CDD:100015  434 amelevg14  amelevg14:Apimel3aEVm009774t2  928 404 466 apimel1:GB10009-PA  965 395 434 apimel14nc:XP_006558759 896 356 434 ..
CDD:100016  425 apimel14nc amelevg14:Apimel3aEVm006739t16 942 417 452 apimel1:GB11920-PA  944 391 431 apimel14nc:XP_006567220 663 294 466 ..
CDD:100017  431 same4      amelevg14:Apimel3aEVm010780t1  880 353 432 apimel1:GB18755-PA  889 353 432 apimel14nc:XP_394981    889 353 432 ..
with summary tables cdd-alleuks-dompair5sum.txt (longest align) and cdd-alleuks-dompair4sum.txt (highest identity) of the 34 animal and plant species gene sets analyzed. Statistics pHit, paln, pbest, the percentages of present (hit), aligned and best score per CD of nRef CD are plotted above, from columns "nRef	nHit	pHit	bits	iden	algn	paln	ptop	best	same	diff	miss	pbest"
Note: Apis Evigene 2014 and Apis NCBI 2014 used same Apis RNA-seq, NCBI used additional genome data. Best includes ties, where 2nd is nearly same as best score.